Mayor Scott Galvin is pleased to announce this year’s winners of three, $1,000 higher education scholarships from Waste Management are Shaeleigh Chinian, Westfield State College; Lauren Nixon, Worcester State College; and Keeley Pavlik, Endicott College. 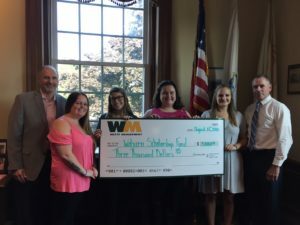 Mayor Galvin, in conjunction with the Board of Health, recently launched this series of higher education scholarships sponsored by Waste Management, trash hauler serving the City of Woburn for more than 10 years. Winners were drawn at random from more than 100 qualifying applicants. To qualify, applicants must be a Woburn resident and enrolled in a two-year or four-year college or university, a trade school or the U.S. Military. Waste Management has served as the City of Woburn’s trash hauler for more than 10 years, and has consistently delivered the highest quality curbside trash and recycling services to the neighborhoods of Woburn.